I still have quite a bit to finish up in Emerson's room but here's a peek at a few things that I have completed. The light fixture is hung and I've had a couple of pillows made. I'm not sure who made the rose fabric, but it's a classic chintz. The red dot fabric is called La Pluie by Brunschwig and Fils. 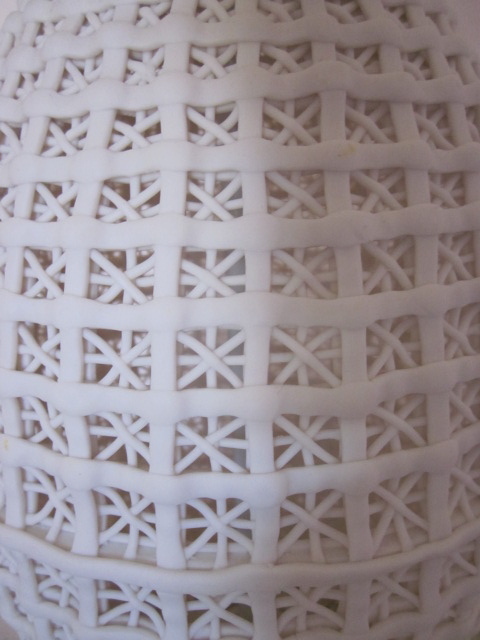 The bottom image is of the porcelain lattice lamp in her room. I'll of course have shots of her finished room soon. I also painted the walls in Ben Moore's Mellow Pink. It's a beautiful color!